A dog is a great ice-breaker. People with dogs talk to others with dogs; and people without dogs talk to dog-walkers, too. A week or so ago, I was sitting on the promenade watching the world go by and along came a couple with a gorgeous Newfoundland they were evidently trying to take for a walk. The trouble was that every few yards someone, attracted by the huge handsome dog, would stop them to ask about it, whereupon the Newfie threw himself on his back and invited some tummy-tickling; and the sight of a gigantic furry dog happily sprawling attracted more admirers like a magnet. My good friend Jen Gilroy sent me this badge, which she got at the RWA Conference. Isn't it fab? 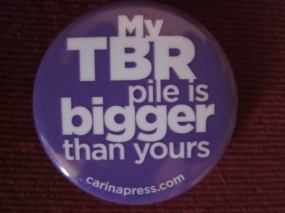 Since I started wearing it, several strangers have asked me what TBR means, which has led to conversations about books, writers, reading habits and film adaptations. Llandudno is the sort of easy-going place where it's normal for strangers to chat. If you aren't cooing over a dog, the conversation generally opens with, "Are you here on holiday?" (and oh, how I love being able to say, "We live here. "), but it has been as delightful as it has been unexpected to talk about books with new people. What's in your TBR pile? Whom do you talk to about books and reading? Have you ever worn something that unexpectedly earned positive attention? Your TBR pile sounds like quite a mixture, Jen. Mine has historicals, sagas, cosy crime and thrillers, as well as cookery books and social history. I enjoyed hearing about the lady who misses M&S - I hope she gets to visit the UK one day. She'll have to bring an empty suitcase with her to fill up. Chiming in late, but better late than never! I'm delighted that my gift has sparked conversations about books and reading for you. My TBR pile is, as always, a mixture - contemporary romance, historical and women's fiction, baking and cookery, and a few child development titles. I also have several magazines as I'm catching up on some favourites since returning to Canada. I talk about books and reading with anyone willing to put up with me! As for wearing something that unexpectedly attracted positive attention, my most recent experience was while waiting to board a flight last week. The woman behind me in the queue admired my cardigan and, when I mentioned it was from M&S in the UK, she told me how sad she was when M&S stores closed in Canada, and how M&S was top of her list of places to visit if she ever made it to England! Thank you for your lovely long response, Jan. I'm glad you had such a good time at Tenby. I'm looking forward to putting faces to names at Lancaster next year. Of course, the "problem" with an event like Tenby is that you end up with a tottering TBR pile - but that's a good problem to have, isn't it! Have a wonderful time on your holiday. I love the sound of your badge, Sue. I spent a wonderful day at Tenby Book Fair yesterday, meeting many of the authors I follow on Twitter and Facebook. It was lovely to put faces to names and talk to them about their books. Needless to say, my TBR pile is much bigger today from the books I bought and the list of titles ready to download on my Kindle. I'm off on holiday ion the morning and look forward to tackling as much of the list I can on. When I was teaching, one year, a colleague made me a badge which told the world 'I survived a year with Class 5B'! There was always a notorious class that each teacher dreaded in September but actually loved them by the following July, wasn't there? It caused a few smiles. It made me laugh thinking about Bonnie being an ice-breaker. The only conversations I ever have with other dog walkers are from the opposite sides of fields or over hedges as she doesn't like other dogs! Took me a while to work out what it meant!